A bust of Claude Monet by the sculptor Daniel Goupil can be admired in Giverny. Surprisingly enough, the tribute to the master of Impressionism is not exhibited on a well exposed location, in front of his home for instance. On the contrary you have to look for it to find it. The artist wanted Monet to face the landscape he loved, the meadows and the poplars of the Seine valley. 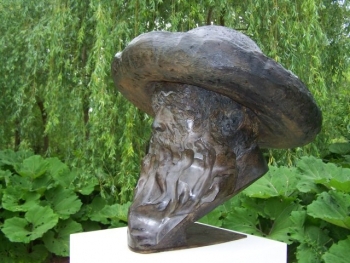 The bust is situated on the very spot where Monet painted several canvases. It is to be found on the back of the main parking lot ‘La Prairie’, slightly hidden by a big weping willow.